OLD SEAGROVE Gulf Views from Old Seagrove! Located one back from the beach, ''Intensive Care'' is your perfect summertime prescription! Offering genuine Old Florida appeal, complete with ultra-modern conveniences. Spacious & comfortable porches and sun decks, a heated pool, elevator, garage & more. Maximizing gulf views along with countless interior details -notable 200 yr. old heart pine floors, vaulted bead board ceiling, custom coquina fireplace, elegant blue granite, pebble stone & slate floors and custom cabinetry. Gathering places begin on the ground floor with a media/game room, 4 bedrooms and 3 baths. Convenient first floor kitchen/wetbar enhances the poolside entertaining environment. Main level gourmet kitchen w/Viking appliances offering gas range, warming drawer, wine cooler, ice makerand large farm sink. The master bedroom, situated on the main level, looks out onto the gulf and has been thoughtfully designed to incorporate custom built-in closets & vanity w/slipper whirlpool tub, slate floors & shower. Additional guest bedroom (and laundry) on the main level for a total of 6 bedrooms! 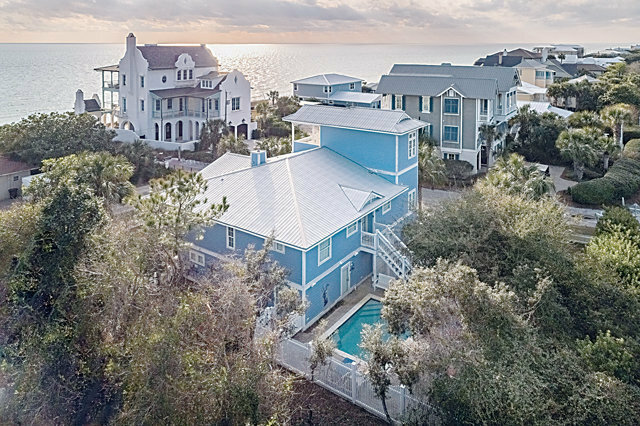 Celebrate the end of each day by enjoying 30A's amazing sunsets from the third floor gathering area & porch, fully equipped with a complete wet bar, wine cooler, refrigerator, ice maker and dishwasher. What more!? Let "Intensive Care" take care of you! NO HOA & beach access just across the street.